Bread oven. Brick, mortar, cast iron . 18th and 19th century. 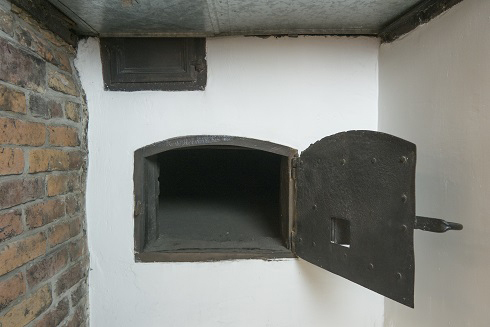 The oven plays an important role in the Monastery, with so many mouths to feed. It’s used to make bread, baked beans and cakes. But it also presents a real fire hazard. In fact, the first fire at the Monastery was caused by an oven. A cook had left some embers smoldering in the oven to keep her bread dough from freezing, but she forgot about them before going to bed that night. The fire consumed the entire Monastery, and the Ursulines had to seek refuge, first with the Augustinians, and later with Madame de la Peltrie.